Originally published in the August 2018 issue of Parity, Australia's national homelessness publication. 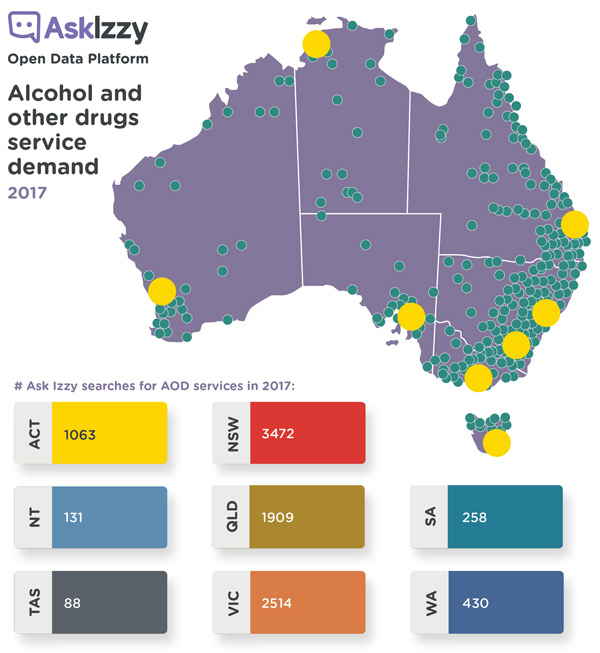 The following information about service demand for alcohol and other drugs services was sourced from the Ask Izzy Open Data Platform, our new open data tool that provides insights about the supply and demand of services across Australia such as housing, food, health and more. Designed as a one-stop data shop for the community and social services sector, the platform aims to provide organisations with information they can use to better tailor support to people who are struggling. The platform brings together data from a range of sources including Ask Izzy, the Australian Institute of Health and Welfare and the Australian Bureau of Statistics to give a comprehensive view of the demand and supply of services across Australia. The Ask Izzy Open Data Platform was developed by Infoxchange with support from Google, and was co-designed with organisations from the community, government and academic sectors.